"The phrase "netbook powerhouse" would typically be considered an oxymoron. That was before ASUS announced its Eee PC 1215N bumpin' a 1.8GHz dual-core Intel Atom D525 processor with NVIDIA Optimus to intelligently switch between its NVIDIA Ion discrete and integrated graphics." 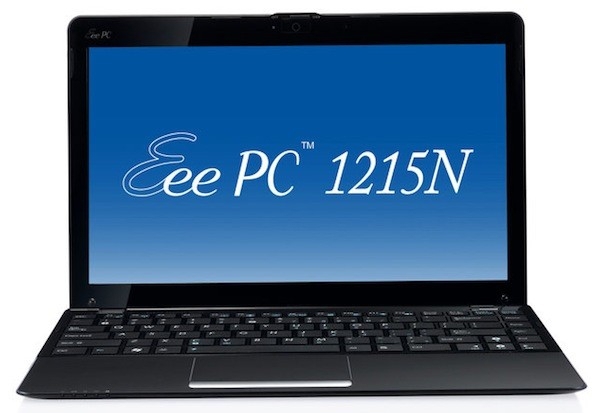 ASUS has always been good at anticipating the changing needs of netbook users, and the new Eee PC 1215N continues the trend, further blurring the thin line between netbook and laptop. Details are a bit sparse today, but this "network powerhouse" sports a dual-core 1.8GHz Intel Atom D525 processor, a 12-inch 1366x768 display, NVIDIA Optimus to allow switching between integrated and NVIDIA ION graphics, and hardware decoding for H.264, MPEG2 and VC1 HD Videos to allow 1080p video playback in 16:9 format. Also included is 802.11n, Bluetooth 3.0 and USB 3.0 support, and pass-through USB support to charge mobile devices while the netbook is powered off. ASUS also offers global Boingo Wi-Fi access at a "special" price, enabling access to over 100K hotspots globally. The 1215N's 250GB or 320GB of local storage is supplemented by 500GB of ASUS Web Storage, featuring drag and drop capability. Depending on extensibility and price, ASUS really is making the laptop or netbook decision difficult. A larger display and robust graphics, coupled with a strong feature set seems to make for a winner!